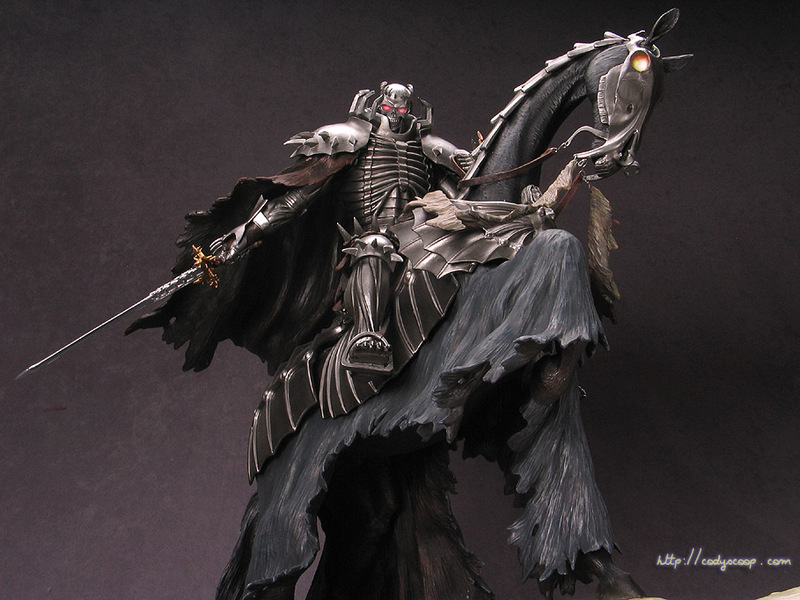 This awesome Skeleton Knight (or Skull Knight) is from one of my fav manga series Berserk. Check out the Art of War site for their cool Berserk line up. There was another Skeleton Knight on horse before, but this one beats it hands down. It compares favorably to my two yet-to-finish grail kits, Guts and Griffith on horses. I seriously think that AoW has two sculptors, one that’s very experienced and one not so much. Some of their kits just have horrible proportions, the same person can’t be sculpting these awesome on-horse kits. Anyway since only the prepaint statue was available, and these things sell out immediately, I had to get it. There are two versions of the kit, one with normal sword and one with the “Priming Sword” that has the eyes on it. I think both have their merits, the Priming one definitely has the cool factor, and I like how the vines tangle on the “blade”; but the down side is that the “blade” just looks like a meat rod full of eyes, which doesn’t look like something you cut things with. Anyway, I got the normal version and was happy about it. The paint job was ok, but definitely needs work. I didn’t have time to redo the base and it seems the painter has done a decent enough job, so I left it alone. Skully and his horse though got a complete repaint. All the metal areas are redone with Alclad metalizers, mainly steel for the darker parts and polished aluminum highlights. The paint actually reacts well to my dark oil wash too, coolness. I’ve also created some patterns for the shield so that it doesn’t look so boring (originally it’s just monochrome with the red insigna). All the reliefed areas got properly drybrushed. The fluorescent paints on Skully’s and horsey’s eyes do wonders once again under flash, and I feathered some titanium whites in the middle of each. Horsey gets a midnight blue toned body with a bit of pearl white drybrushed – I’ve always wanted to try pearls on horses since their skin looks so shiny 🙂 I tried to give all the parts more variations in color tones, because otherwise the dude will just be surrounded by black, which is one problem I have with the original paint job. His cape/loin cloth gets a reddish brown tone, and to distinguish from horsey the horse cloth has a navy blue tone with some heavy drybrushing to brighten the piece. One last thing I wanted to mention is that I’m extremely pleased with Alclad’s gold, the color is “Pale Gold”, but there’s nothing pale about it. It’s actually pretty warm, and beats all the gold colors I’ve tried so far. Typical gold paints are full of brass metal bits, so the gold looks very “pale” in the sense that it’s closer to silver, like Mr. Color’s gold. Mr. Metal Color gold has the right tone, but the thing doesn’t last on unprotected surfaces 🙁 Anyway, thumbs up for Alclad! Man… I just love the AoW-horseback kits. There’s just something about them, they look totally amazing. It looks wonderful, this one.